This post (after a few edits) was originally published in Top Five Records. You can read it here. “Love, peace... and rock n' roll” reads the tag line on their Facebook page; And after attending their recent gig at Hard Rock Cafe in Hyderabad, the writer is as unsure of the first two, as he is certain, of the third. To the extent of which the words “no-nonsense” go, Girish and the Chronicles are absolutely no-nonsense when it comes to making and doing “good” rock music. They are among those fast disappearing groups of musicians in this country today, who neither scream profanities in the name of death metal while showing their fingers to all and sundry; nor do they puke sloppy emo stuff for people whose intellectual bandwidth rarely betters that of the bovine. In other words, they are pretty much perfect for lovers of true, classic hard rock. They're perfect for people who like to get their heads banging as much as they like to bask in the glory of the golden age of music gone by. But first, here's some introduction. Legend has it that good ol' rock n' roll runs in the veins, up there in the mountains – with kids picking up guitars before picking up pencils in their childhood - and it certainly seems to be such a case here. Once you've heard them live (or otherwise), you'll be certain that such talent isn't acquired over the years. It's innate. It's built into you when you're born. It's intuitive. Heartfelt. When they started out in HRC, on the subsequently epic evening of 5th September, the first thing I noticed about them, and particularly Girish, was his powerful vocal range. I had heard some of his cover songs before on YouTube, and yes, I had been pretty darn impressed; but this was unlike anything I had heard in my life. It was staggering. His voice reached peaks and troughs that could have rivaled the very best in the world, and there we were, being given a taste of such talent in good old Hyderabad. They did some OCs in the beginning – songs ranging from hard rock (“The Revolving Barrel”) to softer and more melodic stuff (“A New Beginning”) and then moved on to what they really do best – covers. As the handful of people who had gathered that evening watched on in awe and wonder – they took almost every big name in the history of rock music by the scruff of its neck, and gave them a taste of their own classics in the most incredible way possible. First it was AC-DC. Highway to Hell was sent flying over the boundary amid an ecstatic crowd. TNT followed suit. One couldn't help but admire the sheer power that Girish unleashed through his vocals. Ask any lover of classic rock and he'll vouch that Brian Johnson's vocals are probably one of the most difficult to mimic in a live event – but here was Girish, doing just that. After AC-DC they took up Pink Floyd's evergreen Another Brick in the Wall, which I had heard exactly a week back at the same place. This too, was done exceedingly well. They threw in an OC here and there, and then dedicating the next song to all the happy couples in the crowd – they kicked off with Bon Jovi's Always. It was scarcely believable, how the same person who could shriek like Brian Johnson and Bon Scott, could do as much justice to a song which was the stark opposite half an hour later. But the variety had just begun. Next in line to be whacked into orbit was Skid Row's epic power-ballad, 18 and Life – yet another gem that often creeps into discussions about world-conquering vocalists – thanks to Sebastian Bach's equally epic vocal range. Well, yeah, the evening was epic, I mentioned right? The smattering of people who had originally gathered had now developed into a decent number – which was good, because this was when GnTC went back further back in time to treat us to a couple of behemoths from one of those genre-defining albums in the timeline of rock : Black Dog and Rock and Roll from Led Zeppelin IV. Their execution was so sublime, that it would have moved even the staunchest of Led Zep lovers to tears. It was spot on. Stunning. And the fact that Suraz Karki – the chap on lead guitars – looked a lot like Jimmy Page only helped things. Rock and Roll is a considered by many rock aficionados to be a “complete” song – because it lacks absolutely nothing on any front – be it on drums, guitars, bass or vocals. The mere attempt to cover it is bold, but going by the spree they were on that evening, it didn't come as a surprise when they nailed it to the last riff – hook, line and sinker. With Led Zep done and dusted, they went even further back in time to bring to life a classic by The Doors – Roadhouse Blues. This was when Girish announced that they would go a bit off their conventional act of classic hard rock, and experiment with something different, but something, he assured us, we'd all like. And there began Smells Like Teen Spirit. It wasn't about how well they were executing these classics. It wasn't about how faithful to the original their covers were. What blew our minds was the consummate ease with which they seemed to shift from AC-DC to Pink Floyd. From Bon Jovi to Skid Row. From Led Zeppelin to Nirvana. It was as if Girish was an electronic device, on which you could change the mode from “Brian Johnson” to “Robert Plant” to “Kurt Cobain” by pressing a few buttons. They made it look all so easy. So very simple. It had been over ninety minutes now, that GnTC had belted out song after song, classic after classic, and the evening was nearing its tragic end; which was when Girish kept his guitar aside, and told a now-frenzied crowd that he'd give us two options for their closing song. And as a tribute to the greatest and baddest hard rock band of all time – it would either be Welcome to the Jungle or Sweet Child O' Mine. With this announcement, the crowd went berserk. But when there seemed to be no clear winner by popular vote, they decided to do both. First up, Welcome to the Jungle. VH1 named it the “greatest hard rock song of all time” in 2009. And there's a clear reason why. That one song embodies the soul of hard rock. It is the yardstick that prospective hard rock artists aim for when making a new song. It stands for the music of 80s; for the badass culture that Guns N' Roses heralded; for one of the greatest duos that rock music has ever seen – that of Axl Rose and Saul Hudson. 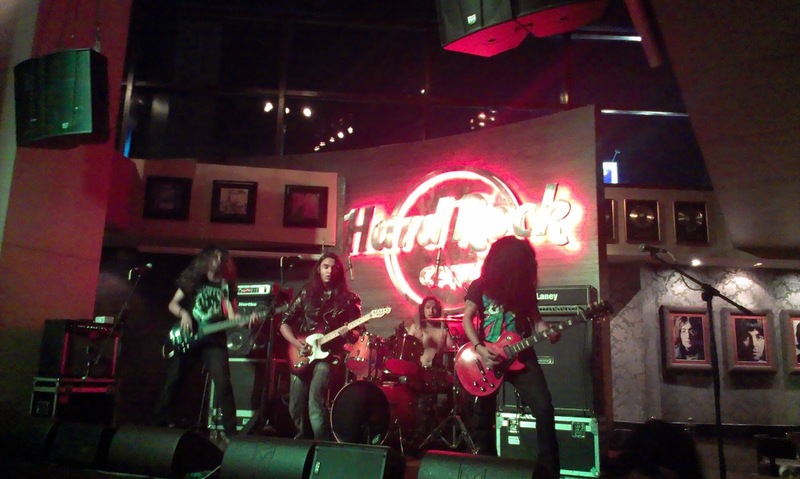 It would only be fitting that a hard rock night have it – and boy did it! Girish began with the usual Axl Rose chant “Do you know where you are? You're in a jungle baby! You're gonna die!” - and Suraz did the rest of the inauguration with the iconic riff. From then on there was no looking back. Girish's vocals reached new heights of brilliance – as he brought in Axl's throaty screams – in a manner that would have made old Axl ring his lawyers. With Welcome to the Jungle done, they embarked on the last song of the night – arguably the world's most loved power-ballad – Sweet Child. When Suraz hit the riffs that Slash had allegedly composed in five minutes as a joke nearly three decades ago – and which are today one of the best known riffs in rock music – the crowd cheering went through the roof. Hard Rock Cafe had never lived up to its name so well before. Girish's vocals reached meteoric heights for one last time that evening, and Suraz did complete justice to the solo that, even after a million listens never fails to amaze the listener. After the final shriek of “Sweet chaa-aa-aa-aa-ld of...chaa-aa-aa-aa-ld of … chaa-aa-aa-aa-ld of maaaaaa-ine” - a clear several notes above Axl's original – Girish cemented a lasting mark in the minds of every person who was present there that evening. This gig wasn't just a tribute to the names and the bands who had shaped the genre that we all love. It was proof that in an age of musical blasphemy – when Justin Beiber and Lady Gaga manage to garner more Twitter followers than all the bands of the yesteryears put together – there is still hope - that somewhere out there, someone, with a guitar still does and will do good ol' rock music for years to come.